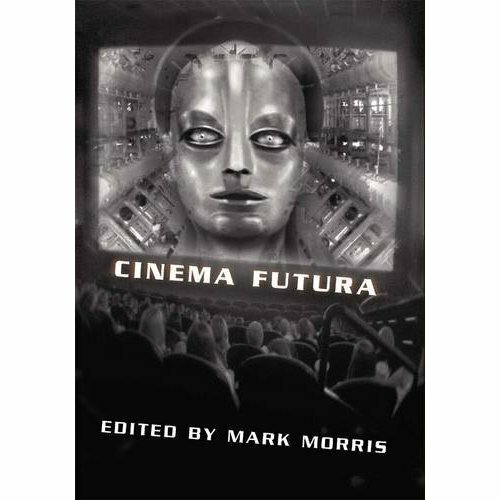 Cinema Futura, the new collection edited by Mark Morris from PS Publishing, brings together a wide range of critics and authors to write a collection of essays on science fiction cinema (starting with Fritz Lang’s silent masterpiece Metropolis and finishing with James Cameron’s Avatar). The introduction sets the tone for the book. Mark Morris insisted that the writers write about those films that they, for whatever reason, wish to champion. This results in a collection of positive and intensely personal essays. While I like snark as much as anyone, it’s refreshing to read people enthusing about something that has moved them in some way. The the essays in this book, then, are overwhelmingly positive. Though the way that the writers may engage with their chosen film may vary slightly some of the essays (though no less personal) spend a little more time examining the context of the film and are (slightly) more academic in their tone. I suspect that this is simply because the essays where this is the case are about older films where the readers (and writers) would have less experience of the time that they were made in. Naturally this puts a little distance between the viewer and the film: in the case of an essay about a contemporary film this doesn’t exist. Furthermore, the way that someone writes about a newer film is again going to be different. You may hold a more recent film in great esteem, but it’s unlikely that you’d be able to summon up a genuine nostalgia for something that was released within the last couple of years. Indeed, in discussing James Cameron’s Avatar, Ian Whates touches on this issue. His feeling being that something, such as Avatar, which whatever else you have to say about it, does have an innovative visual style, and needs to be seen immediately, as robbed of its context, some of its power is lost. Having said that, this is related via an anecdote about a discussion with a younger critic who felt that the 1970s film Silent Running was just a poor quality film, whilst Whates believed that, in the context of its time, it was immensely powerful. I have to confess that I (as a younger fellow myself!) disagree. Though I don’t have the context, I actually think that in spite of Silent Running having flaws it still, along with some other 70s SF cinema, points to a different way of doing SF on film from the now almost default position of big budget no-brain action film. For me, Moon, recreates this well. On the subject of Silent Running, though, Alastair Reynolds does point out that, while it is wrong with regard to date, and prediction, it – worryingly – does still have something to say about what we are doing to our environment and though it is removed from a cultural or artistic context (Star Wars saw to that) it isn’t devoid of interest outside of intellectual acceptance of its environmental concern. Cinema Futura contains an admirably wide selection of films. Including films, such as Ealing classic, The Man in the White Suit which I’d agree is correctly included in this selection and Godard’s Alphaville. Given the large number of essays that there are in the book, I’m not going to try and cover them all. I’m sure, though, that if you love SF cinema you will find things to smile about as you recognise the joy that these films have clearly brought to each of the writers. Don’t imagine that this means, however, fanboyish obsession with the minutiae in the world presented in the films. This is, mostly, about emotions and how the films relate to their lives. Few of these films can claim to be universal classics (though I think a few deserve the greater recognition they receive, Tarkovsky’s Stalker, Kubrick’s 2001 are genuine classics; I think Godard made better films, but Alphaville certainly wouldn’t embarrass itself in any cinematic company). Films, such as Invaders From Mars are, mostly, successful though. Joe R. Lansdale’s essay captures well why this is. He’d seen that film at the height of the Cold War (and while I was aware of the Cold War when I saw it first and the shadow it cast did still exert some hold over my imagination when I first saw this in the 1980s – it’s worth remembering that it wasn’t necessarily obvious at this time that the Soviet Union was on its last legs). It has a rather obvious Cold War theme at heart, but what made it terrifying for Mr Lansdale as a child (and indeed, myself) was the terror that the replacement of those in authority that you are supposed to respect in your youth. Seeing it again recently, this was still clearly a scary prospect (though, as an adult, not quite so terrifying, natch). I can only hope that people could see beyond the now weak special effects to enjoy the genuine terror in the film. Adam Roberts, in his piece on Tarkovsky’s Stalker, captures the dreamlike qualities of the film, but also the emotional resonance that this particular film has. Since I first saw Stalker, I’ve held it in high esteem. However, it is one – along with Tarkovsky’s adaptation of Stanislaw Lem’s Solaris – which comes in for unfair criticism. Stalker isn’t a film that you could ever accuse of being fast paced. This doesn’t mean, however, that it’s in any way dull; quite often, it is accused by thoughtful and intelligent critics of cinema of being tedious. It’s good to have ones own prejudices confirmed. Roberts in his essay captures both the quality of the film and the deeper resonance that it has, which I feel is quite often ignored by many. The enthusiasm for their chosen film by each of the writers gives the book a warmth which a drier text would perhaps not have had. The writers are all clearly genre fans, this gives the book an intimacy and allows for shared love and experience, which I think elevates it. These aren’t reviews written because the film critic has been dispatched to the cinema to write copy for the arts section. I don’t think that this is necessarily a good introduction to the films if you’re unfamiliar with most of them; the reflective nature of the pieces does tend to mean that there are spoilers in the essays. This isn’t detrimental to the book, it’s just something to be aware of. As a companion to science fiction cinema, this is excellent, featuring a wide-range of films and authors all able to write intelligently about and with affection for their subject. Recommended for fans of science fiction cinema. This entry was posted in Review and tagged essays, film, mark morris, sf. Bookmark the permalink. Thanks for stopping by (glad you enjoyed it)! Haha, I know what you mean. Though I do have to confess that is to a point. It’s a cliché, but too much post Star Wars SF films are just charmless action flicks that happen to have robots/spaceships/be set in the future. *boooom* *kabababababoooom* *bloooooie* etc. I dunno, Moon was pretty amazing…. And, well, Bladerunner is post-Star Wars and pretty amazing. And Gattaca…. Oh… I concur – Moon was tremendous; I loved it a lot (ditto Bladerunner – I must’ve seen that film a million times*). Should’ve been a bit more specific: every so often you do get a good SF flick now (the Spanish film Timecrimes and Primer both spring to mind). But the bad, what would’ve been pulpy stuff “back in the day” and been at least entertaining is just pointless piffle like Terminator Salvation. Jesus, that film was awful. And there’s a little irony in that: the original film was a pretty good impression of a 50s B-Movie in tone I think.